I wanted to share with you a renovation at St. Louis Church in Memphis [...] that was recently completed. The church was built in the late 1950s in an austere style prevalent at that time. Little changed after Vatican II. Originally, there was a very plain marble altar attached to the back wall with a freestanding tabernacle on top. 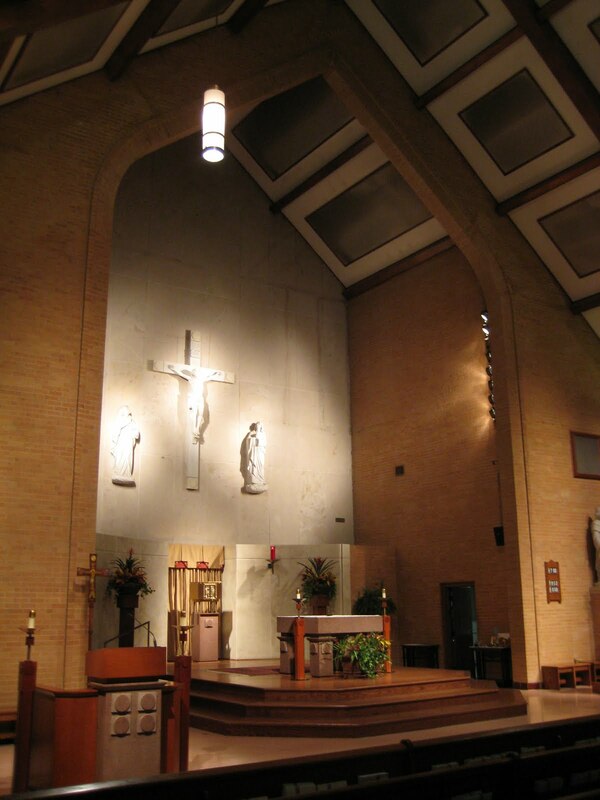 In the late 1990s, the original altar was removed and the tabernacle was placed upon a pedestal. A matching altar of sacrifice and ambo were made at this time as well. The pastor, Msgr. John McArthur was very instrumental in the redesign. Victor Buchholz, of the firm of Looney Ricks Kiss in Memphis, was the principal architect. I normally am somewhat cautious about using a fairly high register of classical elements in a mid-century modern setting, but I am quite impressed at how the fusion succeeded here. The artificially-lit stained glass, according to Mr. Beauregard, is also "one of best [he has] seen - it can be set at 'full sunlight' during the day or a 'twilight' setting for early mornings, evenings and night." My only comment is to remark that a stronger liturgical plan would have been achieved by placing the altar underneath the baldachin, rather than associating the baldachin with the tabernacle shrine, but I also recognize there may have been local factors in laying out the design of which I might be unaware. On the whole, the project shows considerable judiciousness and resourcefulness in its strategic application of traditional elements to what was once a rather dry modernistic interior. Photos below courtesy of Looney Ricks Kiss.